Eldhuset (Fyrhus/Fire House or Flame House, literal meaning). Not to be confused with Fyr or Fyrhus, a lighthouse that is located on a lake, a fjord or an ocean. This house was originally built by Semund Oleson Frankmoen in 1847. 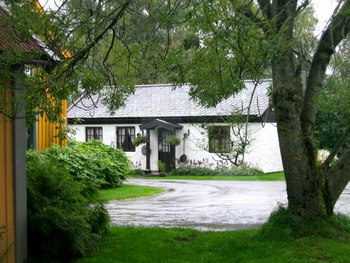 In 1948, it was placed on a farm called Bekken,located in Grimsbu, Folldal. Eldhuset was a small house on the farm. You might say it was "the Norwegian kitchen house" of old. It was utilized for many tasks and it was the central work place for the woman on the farm. Most all baking and food preparation took place there. Notice the tools from "The Olden Days" decorating the fireplace and the wall to the left. 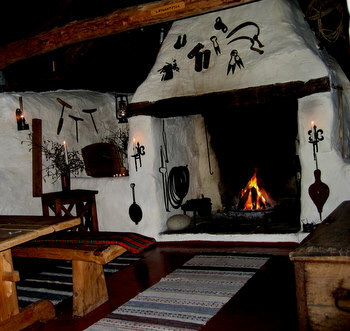 The "fire house" had a stove, which actually was a fireplace (gruve in Norwegian) built of stone. It burned wood and had a removable flat-surfaced disk/griddle that fit over the flames. This griddle (helle or takke) was used to bake lefse, flatbrød and rømmebrød/småbrød, which was prepared on bakstefjøla. Bakstefjøla,a large wooden board/baking surface, was used for rolling out dough. It was about 4' x 5' surface with a frame on three sides so the flour wouldn't end up on the floor. On bakstefjøla you would find a long wooden stick, which I call a "lefse flipper". Here in the states it is called a lefse turner. Last, but not least, you would find a necessary tool, the rolling pin with ridges, which is a must to make these flat breads. In spring and in the fall, the farmers hired "baking ladies" (bakstekjerringer) that would come to the farm and spend many days baking lefse, flatbrød, and småbrød also called rømmebrød (thin sour cream bread). They baked hundreds of piecesdisks of each kind. The disks were cut into quarters (pie shaped) and stacked and stored in chests. They made enough enough bread to feed the family for months. Småbrød/rømmebrød was also made, but that was/is a type of dessert. Småbrød is really delicious. It contains sour cream and is also rolled out thin like lefse, cut into quarters and kept dried. Before serving, it was spread with butter and sprinkled with cinnamon and sugar. Småbrød and lefse is still enjoyed in Norway today. Oh, so yummy. The baked goods were kept in dry storage in special wooden chests in Stabburet, a separate house used as their pantry to store all their food. Eldhuset was also used for parting out animals after butchering and preparing the meats for salting, smoking, curing and drying. It was also used for making sylteflesk, lammerull and mør. Mør is a type of cured, dried sausage, which is still made in Norway today. It is kind of a jerky sausage. It is enjoyed as tasty sandwich meat and/or snack. Other kinds of sausages were made in Eldhuset, such as blodpølse (blood sausage) and sausages made of beef, lamb or pork. 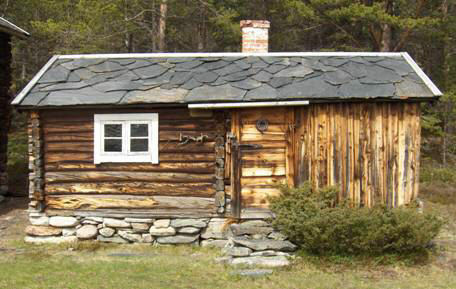 This "kitchen house" was also used to prepare various meats, such as fenalår, which is cured and dried leg of lamb. The lamb was first placed in salt brine; rinsed and dried off. It was then covered with cheese cloth to protect it from dust, dirt and insects. It was hung up in the rafters in stabburet, to dry for many weeks. Here in the USA, we might call it lamb jerky. Fenalår still is a popular delicacy in Norway today. It is sliced thin and eaten with thin, crisp flatbrød (flat bread). Røkt skinke (smoked ham), Norway's answer to prosciutto, was also prepared here, but the smoking of the ham took place in the "Smoke House". After smoking, skinken was then hung up to dry in the rafters of stabburet, which was another small house on the farm used as a pantry. When the griddle/helle was removed storgryta (the large pot) could be used for cooking porridge (graut), soups, stews and other foods. The fireplace (gruva) had an iron chain with hooks where you could hang storgryta. The chain had hooks so one could "adjust" the heat to the temperature needed". Obviously, the closer the pot was to the flame - the hotter the temperature. Don't you prefer the knobs on your stove? Cheese making also took place in the "kitchen house" and that was another use for this large pot. Cheeses such as white and brown goat cheese; nøkkelost, pultost, gammelost, gubb, mølske, etc., were made here. 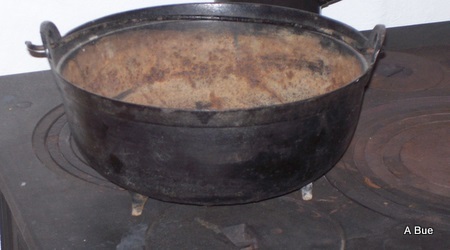 This huge pot was also used to make soap; boiling white clothes and to provide hot water for butchering. The cooking pots in the old days were made of iron. They had a round bottom and with three legs. The objective, of having legs on the pot, of course was, so the pot would stand sturdy on a flat surface. Cooking stoves made of iron had a surface with removable rings, so they could adjust the opening to accommodate various size pots. There was no longer a need for the chain. But this invention came later on. 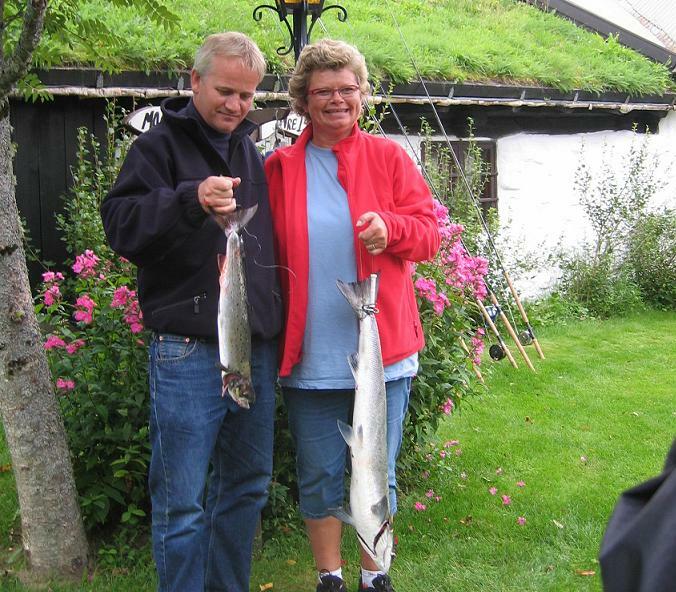 When you visit Åndalsnes, Romsdal, skip over to Devold Farm, where they can give you a comfortable place to stay. 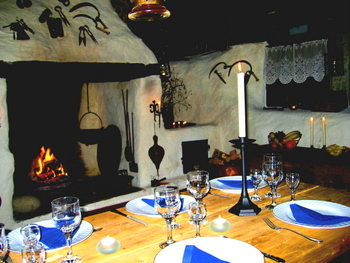 Call ahead to make arrangements to experience Norwegian history and enjoy excellent food at Eldhuset Devold, where they converted Eldhuset, which is the oldest building on the property into a cozy and quaint restaurant/conference room. They will serve dinner to groups of up to 20 guests. And if the sport of salmon fishing gives you a thrill, they will arrange for you to have the time of your life. All you to do is call this number: (011) (47) 71 22 15 18 and ask for Per Devold or send mail to post@devoldgard.no to make reservation. Just tell them that Anne Grete from www.norway-hei.com sent you.